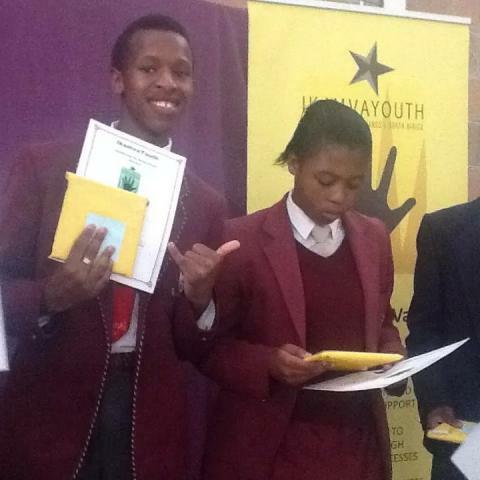 As the year 2014 draws to an end, Ikamva Youth (Nyanga branch) hosted their prize giving event – where the 100 + learners were honored for their hard work throughout the year. 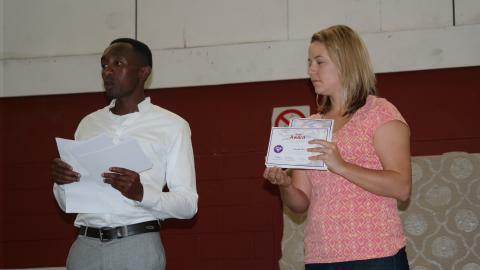 This prize giving was a huge success with an amazing support from the parents and the community of Nyanga. This day saw all the learners come dressed proudly in their various school uniforms, and excited to be part of this event. 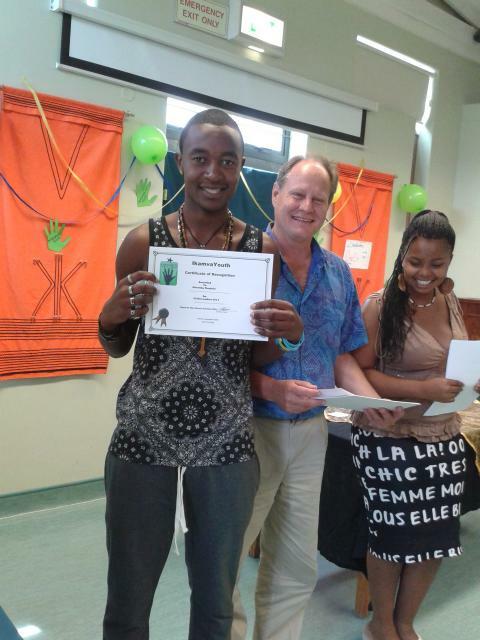 Prize giving marked the end of the 2014 year for the Ikamva Youth learners and finally all their hard work was being honored with various gifts and certificates. It wasn’t only the learners that were being honored but also the tutors, key external stake holders and some of the parents who assisted in the branch during the course of the year 2014 in order to make the IY Nyanga branch a successful and fully operational branch. This prize giving would not have been a success without the great support and donations from State Street who assisted the branch in financial means for our prize giving. Waltons stationary shop for donating our lovely prizes which were received by some of our learners and guests. Another great thanks to our esteemed guest speaker Mr Richard Dyantyi and Mr Wandisile Mdepa from UWC and the lovely Kristen Thomson from Numeric. This prize giving was held at the Oscar Mphetha High school, IY would also like to thank the principal of the school for allowing us to use his school hall. 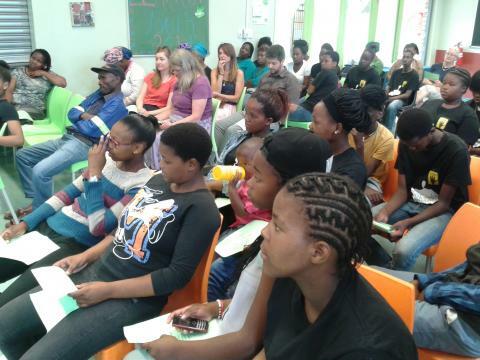 Not only Ikamva youth issued prizes and certificates but our partners Kristen from Numeric issued out certificates and chocolate, to all the learners who participated in the in fundamental math’s programme. Mr Mdepa from UWC also issues out certificates to all the learners who had participated in the grade 11 empowerment workshop. 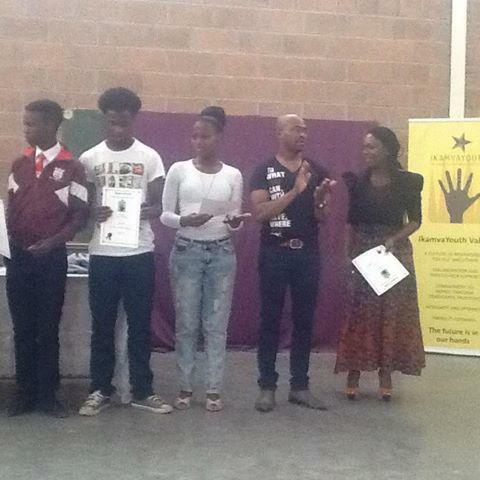 Ikamva youth issues gifts and certificates to the learners who attended the IY programme through the course of the year. 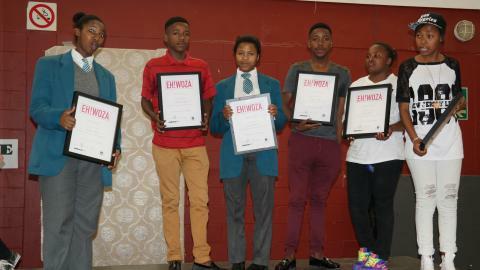 Learners who also did outstandingly well in their academics were honoured on this day. Thank you to all the spport recieved in the year 2014. Saturday 29 November was a day of fun and celebration at the Masiphumelele branch. 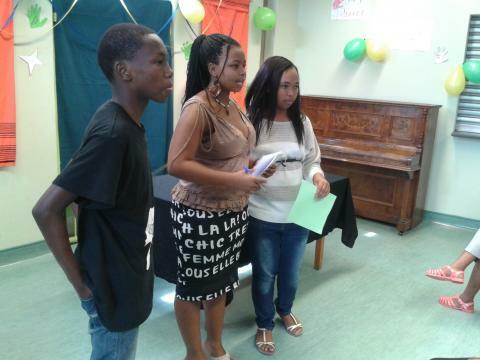 Learners and tutors had their end year prize giving ceremony at Masiphumelele Library. The prize giving is a year-end function that is done every year to appreciate learners and tutors for the great work their done throughout the year. The function was well attended by learners, tutors, family and friends, IkamvaYouth partners and IkamvaYouth staff. The prize giving is where the learners get to be appreciated and acknowledged for their commitment to their own education, as evidence by their presence in the program at the end of the year. 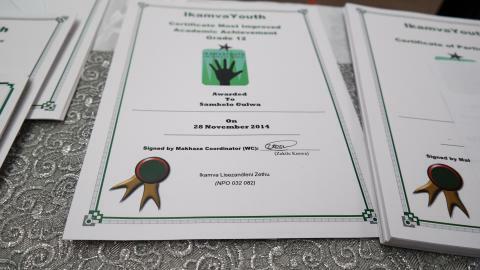 Learners received certificates of attendance based on their commitment on the IkamvaYouth values where learners have to make 75% attendance or more to keep their place at IkamvaYouth, and some learners received certificate of excellence for various achievements such as most improved in academics. There were also certificate for the learner of the year based on his/her behaviour, academics, arriving on time and being prepared for tutoring sessions and this category was voted by learners per grade. Our tutors and volunteers also received certificates of recognition for their tireless efforts, helping the learners with their school work throughout the year. A total of 113 certificates and 56 prizes were issued on the day and the learners were excited to be the centre of all this attention. The parents were happy to see their children awarded with certificates of excellence, appreciation or recognition of their great work throughout the year. The parent of the year(Ms Jonas) a mother of grade 12 learner who always attends our parents meetings and have valuable input at meetings, motivating other parents to commit to their children’s education and applaud IkamvaYouth staff for such good work they’ve done at Masiphumelele community. 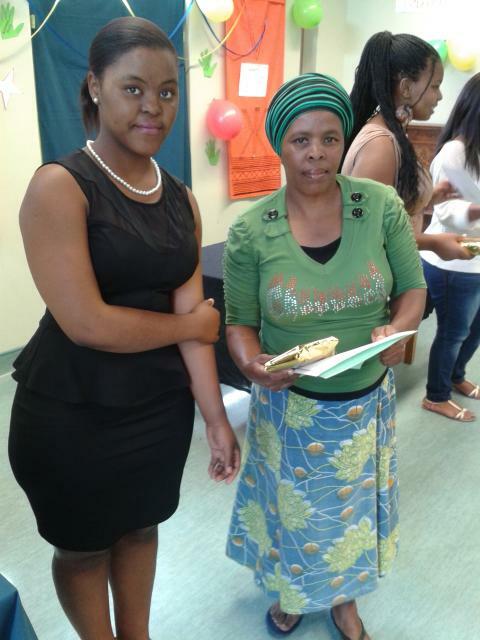 The mother of a grade 12 learner was very happy to receive an acknowledgement by IkamvaYouth staff for her support. We would like to thank all our partners and supporters, notably Pick ’n Pay family store at Fish Hoek, Masiphumelele Library, Masiphumelele Community hall, World Teach, Masi Corp, and Desmond Tutu foundation. IkamvaYouth – The future is in all our hands. 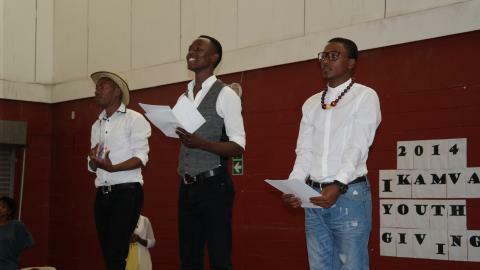 On the afternoon of Friday, 28 November 2014, celebrations were underway in Makhaza at the Desmond Tutu Hall. Where the annual prize giving event was held, in which we recognize and celebrate the achievements of learners, volunteers and stakeholders who have performed well and been a great support throughout the year. 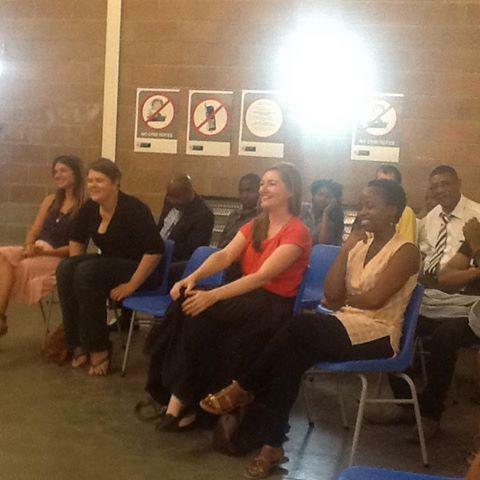 The prize giving was well attended by learners, their families, partners and supporters and IY staff. They bore witness to the great work and sacrifice the learners have made and how these sacrifices were converted into achievement. The categories of the prizes that were given included; academic achievement, most improved learner, outstanding leadership and best attendance (learners above 75%). More than 50% of our Ikamvanites had an average attendance of over 90%. This is a great feat as we have tutoring 6 days a week and this dedication just shows how special this programme is to the learners. Our amazing tutors were also recognised and awarded with certificates. Our partners who work closely with our learners also gave out certificates of participation on the various programmes they hold with these young motivated individuals. Numeric, hosts a mathematics programme, Khan Academy, for grade 9s which is run by Yanga Zukelwa a Maths tutor. Creative Code hosts workshops every Friday afternoon specializing in programming and is run by Marion Walton who is a lecturer from UCT. The facilitators from EWHOZA were also in attendance, they facilitate life skills workshops and have a created a documentary which was directed and produced by the Ikamvanites. We would like to thank the following people who attended the prize giving and those who made this day possible; Desmond Tutu Hall, Tamara Stelma (Mentorship Programme), Nazeema Isaacs Library, Old Mutual, Khwezi Bonani (UCT), Marion Walton (Creative Codes), Kristen Thompson (Numeric), Olga Ganta (Capitec Bank) and Tasha Koch (EWHOZA) and IkamvaYouth Makhaza Tutors.